The curtain rose on Act 2 of "The Daughter of the Regiment." The figure of a tiny woman barely visible in a large dome chair with her back to the audience was revealed. Suddenly, she swiveled around. And there was Supreme Court Justice Ruth Bader Ginsburg. Cheers and prolonged applause rang out from the crowd at the Kennedy Center in Washington. This was even before Ginsburg, a lifelong opera lover who was making her official operatic debut, opened her mouth to speak. She was playing the part of the imperious Duchess of Krakenthorp. Her character, a non-singing role in Donizetti's frothy 1840 comedy, had come to find out whether the title character, Marie, was worthy of marrying her nephew. Looking frail but determined and wearing an elegant acid green silk dress, the 83-year-old justice used a crib sheet. She read off a series of qualifications that sounded very much like requirements for high political or judicial office. Her deadpan delivery was boosted by a microphone. Laughter from the audience occasionally drowned her out. "The best of the house of Krakenthorp have open but not empty minds. The best are willing to listen and learn. No surprise, then, that the most valorous Krakenthorpians have been women." "Applicants seeking a station so exalted must have the fortitude to undergo strict scrutiny. Their character must be beyond reproach." Her biggest laugh came when - in apparent reference to the bogus "birther" campaign against President Obama - she asked whether Marie could produce a birth certificate and added: "We must take precautions against fraudulent pretenders." 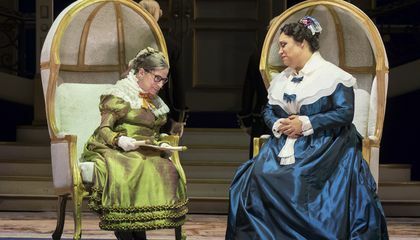 Ginsburg herself wrote her dialogue, in collaboration with Kelley Rourke of the Washington National Opera, which is presenting a new production of the opera. In the original version of "La Fille du Regiment," as it is known in French, the duchess has little dialogue. But the role is often taken by comedians or aging singers. They sometimes improvise their own lines. Francesca Zambello, the WNO's artistic director, had asked Ginsburg to appear in all eight performances. But the justice declined to do more than opening night, citing her "day job." Actress Cindy Gold takes over for the remainder of the run. 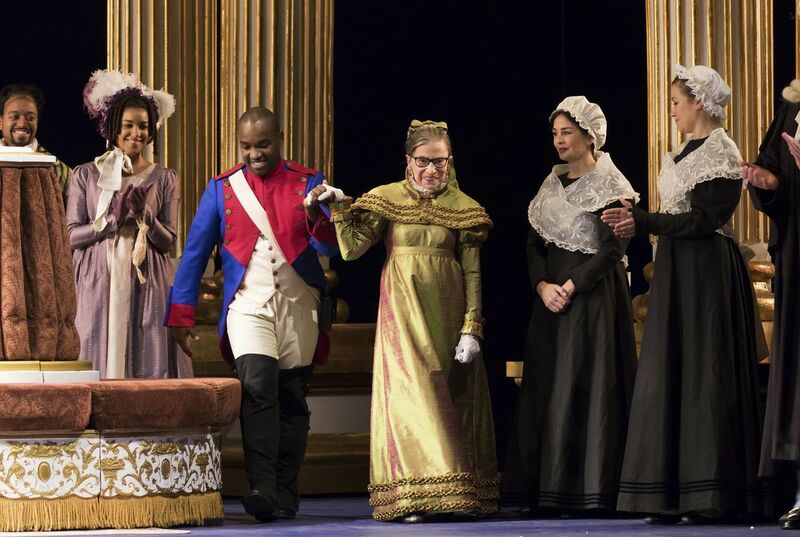 It wasn't Ginsburg's first time on an opera stage. She had appeared three other times dating back to 1994. She never had spoken in a part. This time, her presence added a unique luster to a performance that would have been memorable even without her. That was thanks to world-class singing by the cast, led by soprano Lisette Oropesa as Marie and tenor Lawrence Brownlee as her sweetheart, Tonio. After Ginsburg's first scene, she was escorted off stage. Many in the house gave her a standing ovation. But she was back again near the end. This time, she was brought in by a servant in a white powdered wig of the type worn by British judges. Hearing that Marie has decided to marry Tonio instead of the duke, she exclaimed, "Quel scandale!." Then the justice retreated to a chair, fanning herself vigorously until the curtain fell. And she would appear one final time, led on during the curtain calls by Brownlee. Then, leaning on him for a bit of support, one of the most influential and revered women in American life smiled and curtsied three times to the audience. Why would an opera company allow an amateur to perform with them? This women is a celebrity which may bring more people to the show and she has loved opera for a long time. Anyways she did not get to sing she just spoke to make the part easier but still allowed her to be seen in the performance. The opera company would allow a amateur to perform with them since the person who was doing it was a well known government official. By doing this they would boost there sails and possible get a edge over competition. An opera company would allow an amateur to perform with them to make their performance more valuable to the people and to the performers. In the eleventh paragraph the author states, "...to a performance that would have been memorable without her." This proves that the opera put her in the performance to make the night even more special. If the amateur had watched almost life-long opera. This justice of supreme court had watched opera for many years. The opera want a new person at their show like a very famous person on opera. The new person on opera is much better than other pros at opera. The Ginsburg made some very funny lines than the line at list. I'm not sure, but I would've loved to see her preform. To think that a Supreme Court Judge preformed in an opera seems very entertaining. If they would let new people try to see how good they are it might bring more sales for them. he opera company would allow a amateur to perform with them since the person who was doing it was a well known government official. By doing this they would boost there sails and possible get a edge over competition. They allowed an amateur to perform with them because this person was a well known government official. Because of this their sales boosted and they soared over their competition.